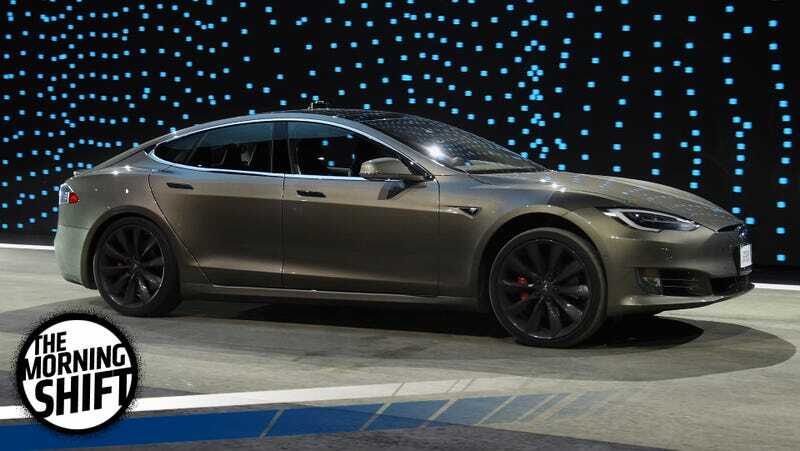 The Tesla Model S, a car which Tesla once tried to claim was so safe that it got 5.4 stars out of a possible 5 stars in its crash tests (which isn’t a thing), was recently downgraded by Consumer Reports for not installing a promised emergency braking feature, reports Reuters. Consumer Reports said both Tesla models previously came with standard automatic emergency braking (AEB), a feature that helps reduce accidents. It said Tesla had cited a software issue for delays of up to six months in enabling the feature on more recent vehicles built since late October. As a result, the Model S is now ranked in third place behind the Lexus LX and the BMW 7 Series in Consumer Reports’ ultra-luxury car category. Tesla said that they would be enabling the automatic emergency braking feature Tuesday through an automatic software update. However, Consumer Reports won’t tweak Tesla’s rating until AEB is installed on all its cars and enabled by default. UPDATE: We heard back from a Tesla spokesperson, who said that “Tesla’s over-the-air rollout of automatic emergency braking began yesterday.” Tesla added that it’s not possible for them to update all the cars simultaneously, but it should all be complete by the end of this week. Tesla Head Starboy Elon Musk still maintains that unionization doesn’t fit Tesla’s mission, but c’mon, man—snooping on and intimidating your own employees isn’t the way to handle it. Changes to Tesla’s already-strict confidentiality agreement are one of the biggest sticking points for workers at the plant. Tesla says their agreement is in line with other automakers’ and tech companies’ agreements regarding trade secrets. Workers insist that many of its provisions are so far-reaching that they can’t even discuss problems at the company with fellow employees, much less talk about the possibility of unionization. The Fremont plant isn’t the only place Tesla is butting heads with its labor. Tesla also has to contend with a possible strike by IG Metall union members at a Tesla subsidiary at Germany, who allege that their wages are unfair. Automakers and oil companies are working together on creating high-octane fuels that lower fuel consumption and increase performance, but you haven’t heard a lot about it because they could be pretty pricey, reports the Detroit Free Press. Development work on super-premium gasoline grades and engines to take advantage of them is going on behind the scenes while automakers and oil companies around the world ponder how to sell the public on the idea. “Ten cents a gallon more is probably palatable. A quarter risks customer acceptance,” said an industry executive who requested anonymity because his company’s plans are secret. Despite the price, automakers are pondering the switch to high-octane fuels because it allows them to run higher compression ratios in engines and use more energy from gasoline. While you may groan at the thought of fueling up your Beige Transportation Appliance with Premium, some believe it’s the lowest-cost way to increase fuel economy and lower emissions. It’s always easy for politicians to wave their middle fingers at the Big Three, but there’s a lot of smaller companies all over North America who could be hosed by any tweaks to NAFTA that make it harder for vital automotive parts to cross borders. Automotive News profiled Canadian supplier Linamar, who has seen consistent growth over the past 22 quarters. Linamar employs 24,500 people in 12 countries, serving the global automotive industry. Until recently, Trump has maintained that the United States’ trade relationship with Canada just needed a “tweak,” which Trump contradicted in grand fashion Monday, when he called the dairy trade a “disgrace” and imposed the large tariffs on lumber. So, there’s no telling what kind of “tweaks” are in store, when they might be coming, or how severe they might be. In a joint release on Tuesday, the National Development and Reform Commission together with the science and industry ministries laid out a development blueprint for the country’s auto industry covering the years through 2025. The government will “open up the restriction on joint venture ownership in an orderly manner,” according to the plan, which didn’t provide details of how the liberalization will be carried out or provide a timeline. As it stands, foreign companies are limited to owning only 50 percent of their Chinese joint ventures. While some worry that Chinese car companies would be immediately crushed by a relaxing of the so-called “50:50 rule,” Chinese automakers are technologically behind. If China wants to boost the number of electric and hybrid vehicles sold in its borders, allowing more foreign ownership may be one way to get there. On this day in 2009, Chrysler and the United Auto Workers (UAW) union reach a tentative deal that meets government requirements for the struggling auto manufacturer to receive more federal funding. Neutral: Did Consumer Reports Make The Right Call? Do you really think automatic emergency braking is worth a downgrade, or is it too new of a technology to be telling consumers to rely on?